As much as the language travel sector is a key segment of the international education industry, little comparative data on the sector’s performance and trends has been available to date, whether globally or for major destination countries. To help address this, the Association of Language Travel Organisations (ALTO) commissioned leading consultancy Deloitte to conduct a global survey of language schools and agencies. The survey was administered in 2014 and drew responses from 100 language programme providers representing 304 schools and 64 agents representing 127 agency offices. This ICEF Monitor article will present some of the findings of the survey, and then it will turn to highlights from a special report from the December 2014 issue of Study Travel Magazine (STM) which looks at recent trends for the eight leading destination markets for English language study. The 304 schools represented in the ALTO-Deloitte Language Travel Industry Survey spread out across the world but – with significant representation in the UK, US, and Canada – have combined net revenues of US$507.8 million. More than half (59%) of respondent schools offer English language courses; 13% offer Spanish; then French (8%), Chinese (6%), German (5%), and then smaller percentages for other languages. Source markets that featured as very important across the broad mix of schools included Brazil, Spain and Italy. The survey respondents reported that 85% of their bookings, on a weighted average basis, were generated through agents. Responses from schools about the average length of time students spend in their language courses provided an average of 5.1 weeks, with adults staying longer (6.1 weeks) than juniors (2.3 weeks). Across the countries, junior weeks brought in more money than adult weeks (an average of US$616 for junior versus US$316 for adult). The UK posted a very high value (US$923 a week) for its junior courses, which the study report says is likely due to a number of schools offering premium junior courses within the UK sample. Asked about whether they witnessed growth or decline in 2014 compared to 2013, the school respondents reported overall growth. In terms of student weeks, respondents noted a 9% increase for junior courses and 16% for adult courses. As for revenue, respondents reported a 10% increase for junior courses and a 16% jump for adult courses. Australian schools reported the biggest growth in student weeks (24%), well ahead of the US, Canada, and South Africa (each at 16%). Australian respondents also saw their revenues jump nicely from 2013 to 2014 (21% growth), as did South Africa (20%) and Canada (19%). Less buoyant, though still experiencing growth, were British schools (11% up for student weeks, 9% up for revenues). When schools were asked about particular issues that have affected their business over the last 12 months, 81% said that economic issues in source countries had had a negative impact. Nearly three-quarters (72%) reported that visa policies in their own country had been a problem for their business. We have reported frequently on the effect of visa policies on international education sectors around the world. It is not surprising then to see Australia enjoying recent growth in both student weeks and revenue given recent changes to its visa system that have been more inclusive of language schools. Agent-respondents to the ALTO-Deloitte survey reported that adult courses compose more of their business mix than junior courses do (65% adult versus 35% junior for student weeks, and 71% adult versus 29% junior for commission revenue). The UK emerged as the top place into which responding agents were booking junior students in 2014, followed by the US, Canada, Ireland, France, and Germany. The mix is slightly different for adult courses, with the UK still top for this but France second this time. The US comes in third, then Canada, then Australia. Roughly as many agents said their junior weeks placements had increased (31%) in 2014 over 2013 as said they had decreased (29%), with 40% saying they had remained the same. There was slightly more growth reported for adult weeks placements: 38% increase, 27% decrease, and 35% no change. Overall, junior weeks revenues did not move up from 2013 for agents, while adult weeks went up by a modest 1.7%. Aside from this being the first year of the ALTO-Deloitte survey, an important caveat that accompanies its findings is that they are based on a self-selecting sample of school and agent respondents. The survey is a valuable new contribution to the available data for the global language travel industry but its results necessarily reflect the make-up of the respondents, both in terms of nationality and mix of business. In that sense, a recent item in Study Travel Magazine represents both a complement and a contrast to the inaugural ALTO-Deloitte survey in providing an overview of recent-year trends in the world’s eight leading destinations for English language study. STM drew on national-level data surveys for its findings of recent industry trends over 2012 and 2013. Like ALTO-Deloitte, it finds some important indicators of growth, albeit at a more modest pace, and provides some broad comparative values for the world’s major study destinations. STM estimates the value of the English language teaching market across the eight leading destinations – the US, UK, Australia, Canada, Ireland, New Zealand, Malta, and South Africa – at just over US$11.7 billion. 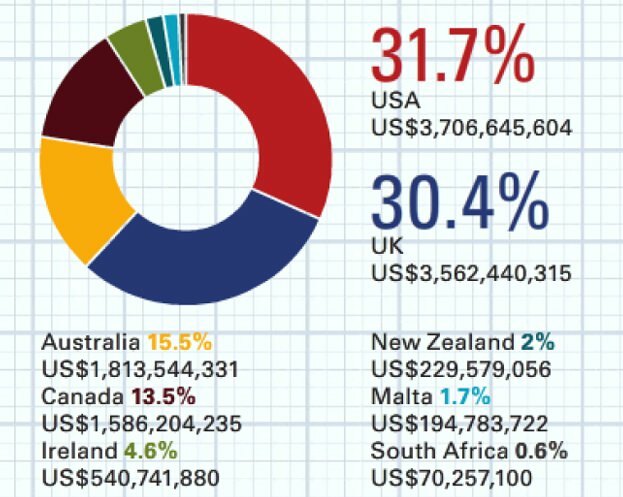 America and the United Kingdom hold the lion’s share of this revenue base, more or less splitting two-thirds of the market between them, followed by Australia and Canada, at 15.5% and 13.5% respectively. 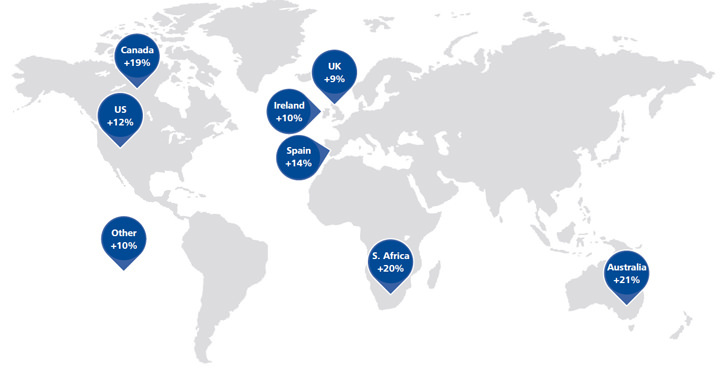 The individual market shares of the remaining destinations in the top eight fall off rather sharply from there, ranging from 4.6% for Ireland to 0.6% for eighth-place South Africa. The STM review finds that, among these eight destinations, revenue grew by 3.3% from 2012 to 2013 with student numbers increasing 0.4% and student-weeks nearly flat (a marginal 0.1% increase over 2012). Australia and Canada were the big gainers among the top four destinations, with revenue growth of 36% and 12% respectively. As with the ALTO-Deloitte survey, STM’s work in compiling and comparing details of market share, growth, relative pricing, and other trends is an important contribution to our overall understanding of the global marketplace. The real value of both the ALTO-Deloitte and STM benchmarks will be in continuing to compile similar data in the years ahead and in using that as a basis for charting longer-terms trends in language travel, both for the global market and for major study destinations. This entry was posted in Africa, Agents, Australia, Australia/Oceania, Brazil, Canada, Europe, France, Germany, Ireland, Italy, Language Learning, Malta, New Zealand, North America, Regions, Research, South Africa, Spain, United Kingdom, United States, Youth Trends and tagged youth trends, language learning, language schools, Intensive English Programs, study abroad.